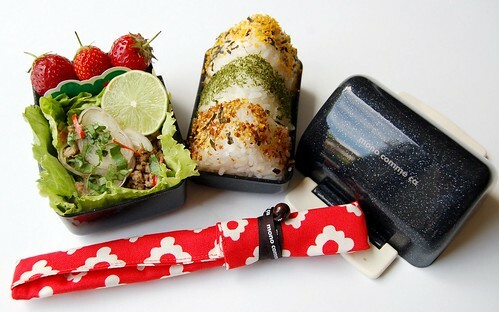 Who would have thought that Narita airport would be full of tempting bento boxes? On a trip to Tokyo, I was resisting the urge to buy hundreds of new ones until I spotted a branch of Mono Comme Ca in the airport’s shopping complex, which had a fairly large range of bento boxes. I picked up this black onigiri box and the red chopstick holder you see here, plus a black chopstick case and a pink two-tier box. These boxes are really high quality, though a bit on the pricey side. I honestly can’t remember how much they were, though! Inside my bento I’ve packed three onigiri with different furikake, a spicy Thai mince with lettuce leaves, and some lovely strawberries. The spicy Thai mince is delicious – for a party, make canapes or starters by pouring this mince into small lettuce leaves (Gem is the best!). Heat a little cooking oil in your pan and fry the ginger, garlic and half the chillies for one minute, or until they become fragrant. Add the mince and break it up as you cook, continuing to stir until it is slightly golden. Like many of my recipes, you can use this to make around four adult bentos, or cook half for dinner and save the rest for your lunch. The mince is equally delicious hot or cold.